A short little video to let people in the audience who might not be familiar with the show know what was what, to remind fans where Season 1 had left off, and to tempt all with hits of what was to come launched the panel for Person of Interest at this year's San Diego Comic-Con. One of my favorite things to see on any panel is a cast that gets along well... a group of people who clearly enjoy one anothers company and working together. Perhaps because I know they work 12 hour days, or because it feels as though some of that real world chemistry carries onto the screen. Whatever the reason, a part of the magic of a fun panel at Comic-Con is that sense that we've caught a glimpse of the fun and joy these people must have in working together to make a show their audience members enjoy tuning in for week after week. 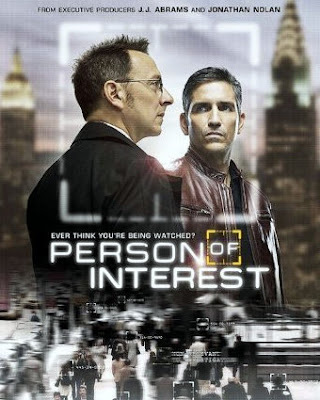 The cast of Person of Interest certainly delivered on the chemistry score! Whether it was Kevin Chapman confessing this is the first show he has worked on where fans will stop him on the street and tell him, "don't get killed" he assumes because they actually like this character, or Taraji P. Henson, when asked what she saw in her characters future, constantly looking over towards the men behind the scenes to see if her guesses were right, "huh, huh, huh!" they just kept giving the audience powerful, fun moments to remember. They come across as a cast of equals, with a great deal of mutal respect, a trait that certainly is conveyed in their performances every week. It provides an interesting new angle from which to re-watch episodes I've already seen, and to view Season 2 episodes. There are some possible spoilers below, but in the wake of this panel, I find myself wanting to share my overall thoughts on Person of Interest, reviewing the entire show to date, as opposed to a specific episode. From the start I have enjoyed the redemption of Lionel Fusco. Reese was a good guy who suffered a crisis of faith, in himself, in what he was doing... like Lionel he's a character of depth that it is easy to feel a strong sense of compassion for. Carter and Finch are the always-upstanding characters. The ones who have turned from temptation and always look for the better way to do things, but are finding that sometimes saving lives and doing what is right means you need a Reese or a Fusco at your back. Someone who will do anything, and now Fusco's conscience is something he is listening to, thanks to Reese, an unlikely gun-totting guardian angel.